María del Rocío Moreno León better known as Rossy Moreno is one of the greatest Mexican luchadoras of all if the times and pioneer of the Dinastía Moreno, being the daughter of Acorazado Moreno. Born on October 17, 1965 in Mexico City. She is the oldest sister of Cynthia Moreno, Alda Moreno, Esther Moreno, and El Oriental. Rossy Moreno debuted on December 30, 1978 in Arena Neza, Mexico State under the tutelage of her father Alfonso Moreno and Ray Mendoza. Though, in the very beginning of her career she wrestled masked under the name of La Enfermera briefly, she lost the mask against India Sioux 0. In despite of the few oppotunities in the beginning of her career due to the the prohibition of women's wrestling in the Mexico City area until 1986, she overcame all difficulties and made a name for herself not only in Mexico but also at international level. A young Rossy Moreno won five hairs in lucha de apuestas and the Mexican National Women's Title. 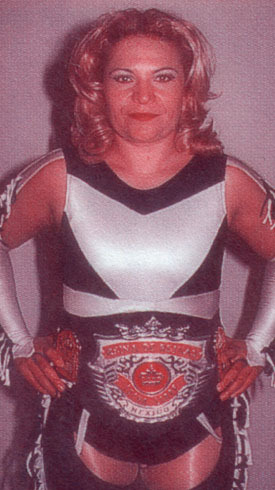 Almost all of her career was in the independent circuit, her first experience in a big promotion was on 1984 for the UWA World Women's Championship against Irma Aguilar in a two out three falls match in which Aguilar retained. The success of AAA with its Women's Division was due to the high quality of the roster and AAA decided to book the Moreno sisters. Years later, a more experienced Rossy Moreno received an opportunity by CMLL. Her first match was on 1991 in Pista Arena Revolución in which she went with hernsister Esther and Vicky Carranza against Lady Star and two Japanese wrestlers. After that match, Rossy was still in CMLL where she won important luchas the apuestas like the hair of Vicky Carranza. In 1997 AAA booked the Moreno sisters. Rossy wrestled only one match in that year with AAA. She teamed up with Esther Moreno and Miss Janeth against her sister Cynthia Moreno, Princesa Sugey and Estrellita. Rossy kept a notable feud with her sisters and she joined with Miss Janeth and Xochitl Hamada and they became one of the most important women trios in the history of the Mexican lucha libre, Las Brujas. 2000 was an important year in the career of Rossy, she became Reina de Reinas for the first time on February 20, defeating her three rivals Martha Villalobos, Miss Janeth and Xochitl Hamada. After a long time there were problems within the trio which lead to a rivalry between Rossy Moreno and Xochitl Hamada. They eventually went to a lucha de apuetas match in which Hamada won. When Hamada left the trio Tiffany joined. After 2008 Rossy went back to the independent circuit. Participated in a battle of the sexes cage match in IWRG in September 2011, in possibly a one match appearance. She usually participates on family promoted shows at Arena Azteca Budokan. She's also training luchadoras. 98/09/18 hair (2) Xochitl Hamada Rossy Moreno Centro de Convenciones - Cd. Madero, Tamps. 08/04/25 hair (5) Estrellita Rossy Moreno Arena Azteca Budokan - Cd. Nezahualcóyotl, México St. This page was last edited on 25 February 2019, at 21:44.